Carrie DiRisio runs multiple popular social media accounts including @BroodingYAHero, and is the social media intern for Serial Box Publishing. Her speaking engagements include talks at the Carnegie Library System of Pittsburgh, Western PA SCBWI workshops, and the upcoming YALSA national symposium. She proudly considers herself a Slytherin and aspiring Disney villainess, who also loves the color pink and making people laugh with funny GIFs. She resides in Pittsburgh, Pennsylvania where she is currently pursuing her MBA in Digital Marketing. 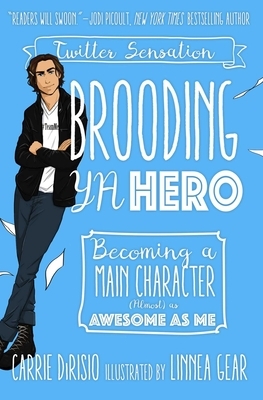 Broody McHottiepants is a master of all trades (Of course. Why would he be anything less than that?) His current hobbies include making bad life choices, shedding manly tears, rescuing clumsy protagonists, and, of course, gazing into everyone's eyes. This is his first book, although he'd like to remind you he's starred in many novels and movies, including your favorite one. He'd also like to remind you to let out that breath you didn't know you were holding. When he's not saving the world from a bleak dystopia, getting crowned Prom King, or falling in a love triangle, he can be found sulking in a corner. Linnea Gear was born and raised in Cave Creek, Arizona, a small town known for its Wild West feel. She has been drawing professionally since 2013. Linnea currently lives in Flagstaff, AZ, earning a BS in Chemistry and currently splits her time between drawing concept art and drawing chemical equations.